I thought Edward O. Wilson was the first person who called for protecting half of the global terrestrial area in order to avoid catastrophic mass extinctions. Now, however, I learned the “Half-Earth” (Wilson, 2016) or “Nature Needs Half” (Locke, 2013) slogans have a decades-long robust scientific consensus among conservation biologists, dating back to Odum brothers’ 1972 paper. 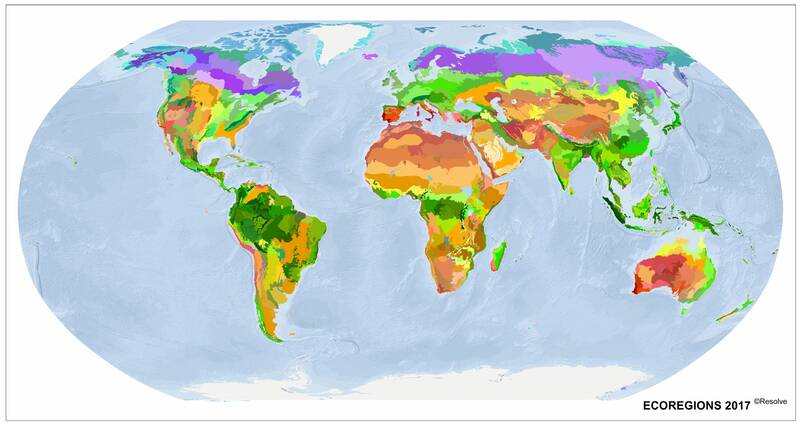 This month, a group of scientists published a comprehensive review paper (Dinerstein et al., 2017) in BioScience along with online thematic maps of 864 ecoregions distributed among the Earth’s 14 terrestrial biomes at http://ecoregions2017.appspot.com/. For this paper, the authors have updated the famous 2001 ecoregions map. Then they assessed the extent of both protected areas and remaining natural habitat withing each (forested and nonforested) ecoregion. Previously, about 15 % of global land was known to be protected. According to this new analysis, only 12 % of the terrestrial biosphere (13 % of forested biomes and 10 % of nonforested biomes) is protected. So the authors suggest that the global efforts increase the amount of land under formal protection by 8 to 10 % per decade, while the current increase rate is 4 % per decade. So, I think the Convention on Biological Diversity can set the “Half-Earth” as a tentative global goal that is its equivalent target to the UNFCCC’s goal of limiting global warming under 2 degrees Celsius from pre-industrial global average surface temperature. Of course, when the IPBES’s global assessment on biodiversity and ecosystem services is published in 2019 (2nd quarter), the official global target endorsed by policymakers might become stricter, just as the Paris Agreement called for limiting the temperature increase to “below 1.5 degrees Celsius” above pre-industrial levels, even further than IPCC’s previous recommendation of 2 degrees-warming. Odum, E. D., & Odum, H. T. (1972). Natural Areas as Necessary Components of Man’s Total Environment. In Transactions of the North American Wildlife and Natural Resources Conference (pp. 178–189). Washington, DC: Wildlife Management Institute. Wilson, E. O. (2016). Half-Earth: Our Planet’s Fight for Life. New York, NY: Liveright.